Sophomore Evan Rodrigues has received the New England Hockey Writers Association’ 2012-13 Paul Hines Award as Most Improved Player. The second team All-Hockey East forward saw his point total improve from 12 as a freshman to 34 (14g, 20a) this year. The writers also selected retiring coach Jack Parker for the Parker/York Award for Contributions to New England Hockey. 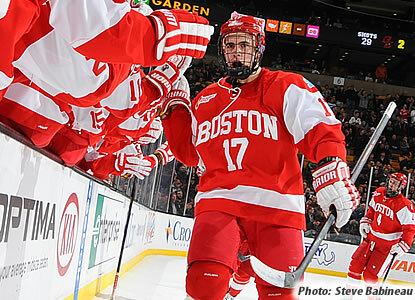 Freshman Danny O’Regan, who led BU in scoring with 38 points, was named to College Hockey News’ All-Rookie Team. Alex Chiasson became the latest former Terrier--and the 68th coached by Jack Parker--to make his NHL debut, skating for the Dallas Stars in a 5-2 loss to Anaheim. Kevin Shattenkirk scored his third goal of the season in the Blue’s 4-1 win against Minnesota. Corey Trivino was named ECHL Rookie of the Month for March, after scoring 10 goals and 11 assists to lead Florida to an 11-3-1 record. WIth 51 points overall, he's fifth in scoring among ECHL rookies. Happy 38th birthday to Shawn Bates, who scored 159 points in four season for BU and played in the Frozen Four each of those seasons. He went on to play 465 NHL games, scoring 198 points, including this goal. Junior co-captain Marie-Philip Poulin and two former BU standouts, 2011-12 captain Jenn Wakefield and defenseman Catherine Ward are skating for Team Canada in the IIHF World Championships beginning April 2 in Ottawa. The trio were part of last year’s gold-medal Canadian squad. In Saturday’s exhibition game against Sweden, they combined for a BU hat trick, with each scoring one of the final three goals in an 8-0 win. Then, in a first-round game against Team USA, Ward scored the tying goal with less than two minutes remaining in the third period. In the ensuing shootout, Wakefield notched the game-winner. 3-2 final. Poulin and junior blueliner Shannon Doyle were named New England Women's Division I All-Stars by the New England Hockey Writers Association.